We’ve taken several important steps on the road to making “MITM-proof communication” on your favorite websites possible. We released the first version of DNSChain, the blockchain-based DNS resolver (fully compatible with canonical DNS). We launched the first public DNSChain server. Its 600 lines of CoffeeScript have been running flawlessly since February 6th. We launched the okTurtles forums and #dnschain IRC channel. DNSChain is the first server to support the *.DNS metaTLD (see below for a detailed explanation of metaTLDs). Unfortunately, so do most users. As detailed in the okTurtles paper, today’s internet faces a security crisis. HTTPS and the technology on which it is based (SSL/TLS) are incapable of securing all connections because the mechanism TLS uses for authentication is insecure. // let's not get caught by "pinning", shall we? Certificate pinning cannot stop this type of mass-surveillance. It is a band-aid that some companies use to mitigate the problem for their specific applications. Pinning is a way to double-check the work that Certificate Authorities (CAs) are tasked with, but it cannot be an answer to this problem because it’s impossible for browsers to ship with the SSL certificates of all of the websites on the internet. Pinning certificates on “first encounter” is untenable from a user & sysadmin perspective. This is where DNSChain and the dotDNS metaTLD come in. metaTLDs do not resolve to the same IP for everyone. Instead, they resolve to an IP that you (the user) trust (and hopefully own). metaTLDs cannot be registered. You already own them. How does this fix our authentication problem? Let me illustrate by showing what it does for the okTurtles project. Instead of relying on X509 PKI CAs, okTurtles asks a trustworthy DNSChain server (trustworthy because *you* chose it) using dotDNS. What’s special about this approach and why does it make okTurtles actually “NSA-proof”? It does not rely on TLS for the answer, and therefore doesn’t rely on the most untrustworthy of CAs out there. DNSChain, likewise, does not rely on CAs. Instead, DNSChain pulls its information from a locally stored blockchain (Namecoin currently, but any blockchain can be supported). The public key for the DNSChain server is pinned in the browser extension. This protects all of the answers that come from DNSChain (including DNS)! Queries to Namecoin can be made over namecoin.dns. Want to know Alice’s public key? Easy, just load http://namecoin.dns/id/Alice and parse the signed JSON. Whom has your computer chosen to trust? Figure 2. If you were to put Root CAs on a number line next to Mom, Dad, and your SO, this is where they’d fall according to X509 PKI. How many Certificate Authorities have you invited over for dinner? If you’re like most people, the answer is zero. If you’re like most people, you wouldn’t have even heard of a CA before reading this post. And yet, to computers, they are like Gods: Infallible Speakers of The Truth™ (except when they’re wrong). Open the Keychain Access application (use Spotlight to find it). Figure 3. Friends of yours? Do you trust all of them with your data? My apologies for my laptop’s screen. 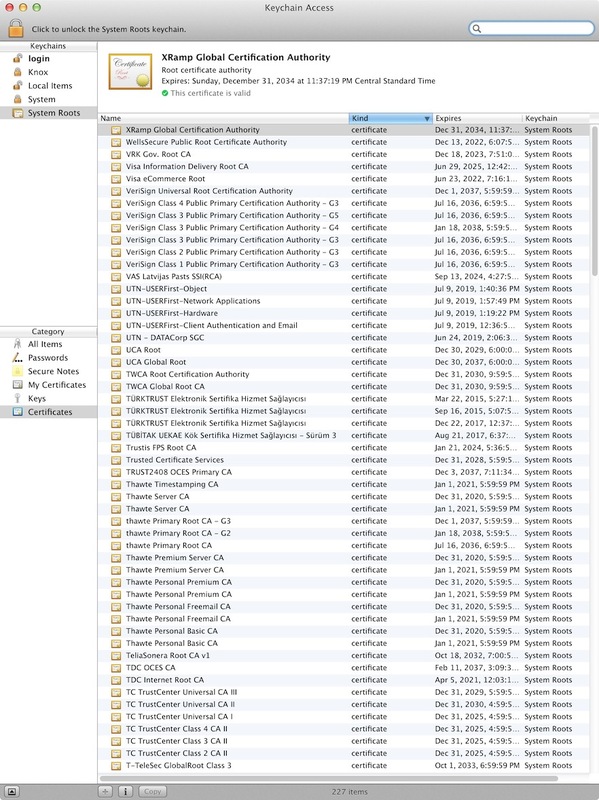 It wasn’t able to show the entire list of 227 Root Certificate Authorities that the operating system trusts for virtually all of its communications security. Who is “EBG Elektronik Sertifika Hizmet Sağlayıcısı”? I don’t know how to pronounce that and yet apparently someone decided everyone (including me) must trust them with all of our online security? Who is “NetLock Halozatbiztonsagi Kft.“? Maybe you know them? Why am I trusting their word that my connections are secure? I don’t remember entrusting all my online communications to “AOL Time Warner Inc.” either, but at least the name sounds familiar! “(c) 1999 VeriSign, Inc. – For authorized use only” Do you remember getting a letter or an email asking for your authorization to entrust them with the security of all of your online communications? I don’t. Just one compromised CA is all it takes for a privileged actor to compromise almost any TLS connection on the entire internet. This is absolutely insane. We must discard this system. Has CA compromise happened? Yes. Do companies pay money in exchange for said broken security? $200+ every year! Do we need CAs? Absolutely not. Nor do we need to pay for SSL certificates. What apps are affected by this problem? The browser you are using right now and all of the websites you visit that have a “secure padlock icon” displayed (except for a few that might be pinned). Email. Including the “secure kind” that goes over “Secure” Socket Layer (SSL). How long has the “security world” known about this problem? Some folks probably knew the day that SSL was invented, however, one of the first internet posts to offer a real solution to the problem is now over four years old, and the EFF’s seminal blog post about the problem is just a tad under that. Will it continue to happen? Don’t worry, bad things can only happen in the past, for up to four years, tops. After that, the bad guys give up their power voluntarily and Google saves us using “Certificate Transparency”. 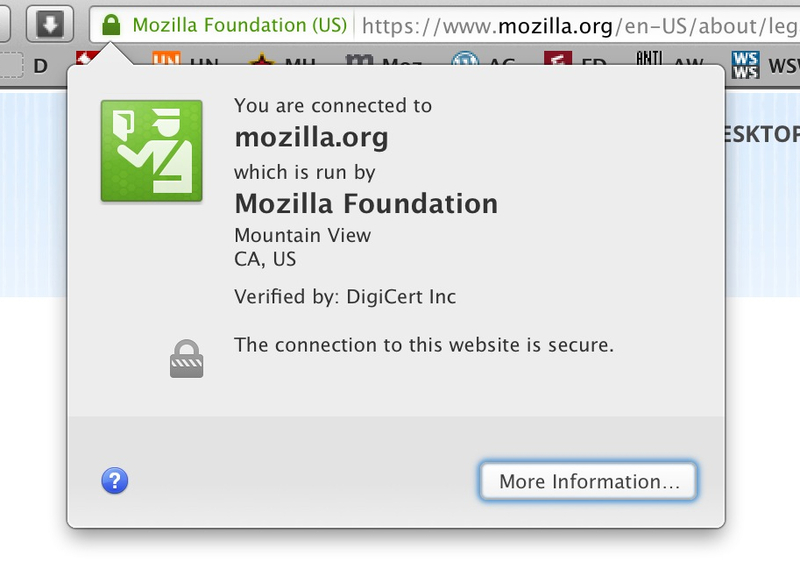 We then get to pay for SSL certificates that don’t really work but they make browsers show those lock icons that say things like “this connection is secure” so it’s all good. Keep yourself informed and follow @okTurtles and @DNSChain. Inform others and call out disinformation. Keep this problem in the public’s conscience. Even the EFF, one of the first organizations to publicly recognize this problem, sometimes forgets about it and hands out green checkboxes to companies that implement “security features” that don’t do anything to fix this problem, without so much as a mention that those features do not protect people from “privileged actors.” This problem is several a couple decades old and it’s not magically going away, even if another million people sign your “Please stop spying on us!” online petition. Help us with DNSChain and okTurtles. Run your own DNSChain server and share it with others. Help them set up theirs. The okTurtles forums are live! 1 Well, as secure as Bitcoin is, which is pretty secure except for that whole 51% thing, but smart people have come up with some smart ideas for that. The coin that chooses not to implement them loses. 2 I divined this figure out of an oracle located in between two cheeks and below a belly button.